Ten years ago, when the Boston Red Sox were sold to a trio of out-of-staters, the new owners signed a contract with state Attorney General Tom Reilly, promising to raise $20 million for area charities over 10 years. Soon after acquiring the team in February 2002, they established the Red Sox Foundation to fulfill that duty. A report released Monday by the foundation reveals that it has donated more than twice that amount — a total of $52 million to charitable programs in the past decade — making the Red Sox by far the most charitable team in Major League Baseball. The report offers a rare bit of good news for a team that has struggled all season, hovering at or near last place in the AL East standings. “Frankly, they do some of the best work in the country, not just in Major League Baseball but all sports,” said Greg Johnson, executive director of the Sports Philanthropy Project, a group headquartered in Cambridge that studies the impact of charity among professional sports teams and players. In 2008 and 2010, he evaluated the charitable efforts of each of the 30 MLB teams. “It’s not just using cash but leveraging the vast amount of assets — the ticket donations, ball park signage, corporate sponsors, the players, the professional staff — in tackling problems,” Johnson said. In 2010 alone, the Red Sox Foundation donated $7.6 million to charities, including those which the foundation itself runs, such as Red Sox Scholars, which provides tutoring, enrichment, and college scholarships to Boston public school students, and Reviving Baseball in Inner Cities, which uses baseball clinics to promote life skills and values for youth. By comparison, the New York Yankees Foundation — which had the second-highest charitable donations in the MLB — gave $3.6 million in 2010, according to tax forms. The New York Mets were third, with about $1.9 million. By almost any measure, the Red Sox are a very wealthy team. According to Forbes magazine, the Red Sox are worth $1 billion. The Yankees are valued at $1.85 billion. In 2011, the Red Sox had revenues of $310 million, compared to the Yankees at $439 million, according to Forbes. The nonprofit foundation revenues do not come from the team’s revenues, but are raised separately. While the Red Sox have given generously to the community, tickets remain the most expensive in baseball, with an average price of $53.38. The Red Sox Foundation’s 10-year total of grants and programs does not include the millions contributed by the team to nonprofits through the donation of more than 40,000 autographed items and Fenway events, 5,500 appearances by current and former players, and tickets to games, concerts, and special events, said the foundation’s executive director, Meg Vaillancourt. The foundation focuses on providing health, educational, recreational, and social services for at-risk groups, ranging from urban youth to military veterans, according to the report. Both the team and the foundation are active in charitable work throughout New England and in Lee County, Fla., the team’s spring training base. The foundation has won awards for the programs it runs, including the first-ever MLB Commissioner’s Award for Philanthropic Excellence in 2010 for its Red Sox Scholars program. The year before, it won the Patterson Award for Excellence in Sport Philanthropy from the Sports Philanthropy Project and the Robert Wood Johnson Foundation. In the 15 years he has been with the Sports Philanthropy Project, Johnson has seen a dramatic increase in sports charity. “Back in the day, teams didn’t have foundations,” he said. “Now, all of them do, in all the professional leagues. It’s part of their business model.” He cites a number of reasons, including good public and community relations and brand-building. Johnson praised the Red Sox Scholars program, which awards college scholarships to low-income Boston middle school students, but also provides them with tutoring and enrichment activities, field trips, job training, and internships. “They don’t just give them money, they give them mentors,” Johnson said. Stephan Phoenix is a Red Sox Scholar who says the foundation has helped him attain his goal of going to college. In the past 10 years, the foundation has donated nearly $900,000 to the Dimock Center, a nonprofit health and social services agency in Roxbury. Players and staffers have also helped renovate the detox center and children’s facilities. 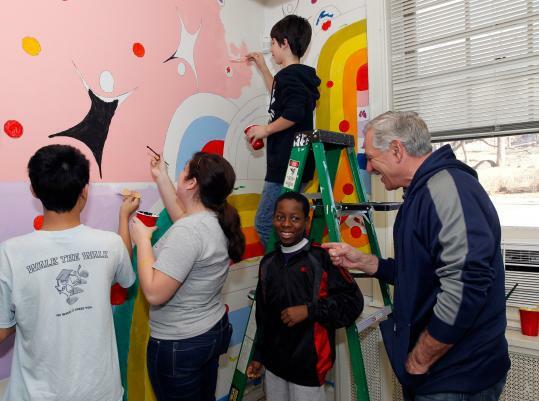 Earlier this year, Red Sox manager Bobby Valentine helped upgrade the preschool area. Another cornerstone program is Home Base, a venture with Massachusetts General Hospital, which serves veterans returning from Iraq and Afghanistan with traumatic brain injuries and combat stress, and also helps their families. In addition to the foundation grants and the team’s in-kind contributions, some of the ownership partners, including Tom Werner and John Henry, and some former and current players have their own charitable foundations. Lucchino, who issetting up a foundation, has helped raise more than $1 billion for Dana-Farber Cancer Institute’s capital campaign. In the past decade, the club has also helped Dana-Farber raise more than $39 million through an annual radio-telethon, an annual Red Sox-themed Rally Against Cancer, and other team events. Boston’s other professional sports teams also have charitable foundations. According to 2010 tax forms, the New England Patriots Charitable Foundation spent $1.6 million on grants and programs that year, the Boston Celtics Shamrock Foundation about $1.1 million, and the Boston Bruins Charitable Foundation $1.2 million. Vaillancourt stressed that the teams’ charitable arms are not in competition with each other. In fact, MLB foundation staffers meet in the offseason to share strategies. “It’s clear that there is plenty of need in every community and we all share the same mission: to harness the passion of our fans and put it to work creating positive changes in our communities,” said Vaillancourt. “Any sports charity doing good work we consider a friend in service to the community — Yankees included,” she said.